On Nov. 28, help the UIC community move forward by giving back. IGNITE Giving Tuesday, the university’s spin on the global holiday, will celebrate the importance of philanthropy by creating an opportunity for people to make an impact through giving. “Giving Tuesday demonstrates the tremendous collective power of giving at UIC,” said Jeff Nearhoof, vice chancellor for advancement. Every gift counts. In the past, funds have been raised for scholarships, campus development and more. Look for lawn signs on campus after Thanksgiving featuring Giving Tuesday facts and statistics. This year, donations will also support a larger campaign called IGNITE, which aims to raise $750 million over five years to advance UIC. “When the campaign is over, participants will have contributed to the impact we’ll have on our students and faculty, the new knowledge they pursue and communities they serve,” Nearhoof said. There are other ways the UIC community and friends can come together on Giving Tuesday. 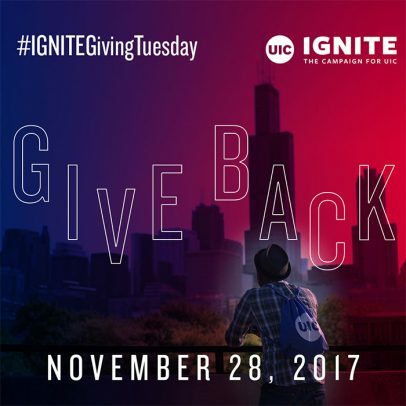 Be part of or follow the action by using the hashtag #IGNITEGivingTuesday on social media and sharing your UIC pride. 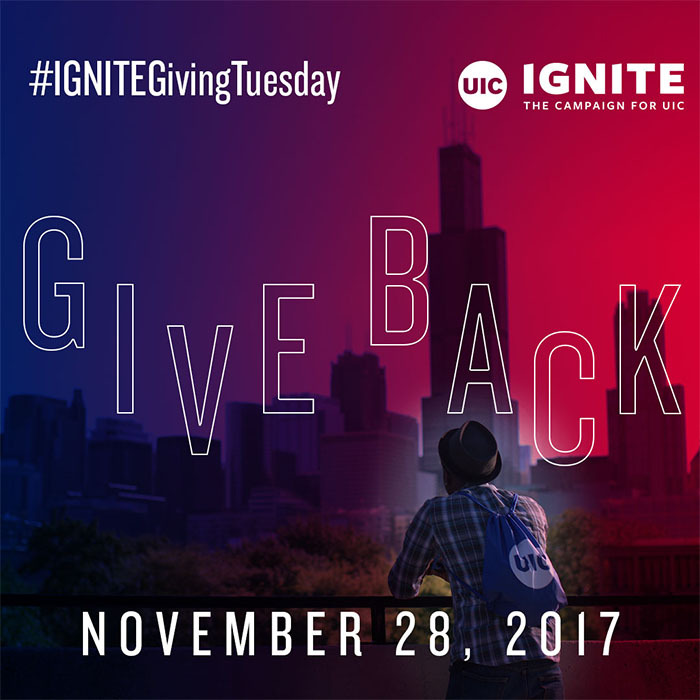 The website givingtuesday.uic.edu will allow people to see the event’s real-time progress, too, and learn more about a department or unit that will directly benefit from donations. The shared goal is to encourage participation. “When our faculty, staff and students, as well as our alumni and friends, come together to support the areas of UIC that are most important to them, we can have a remarkable impact,” Nearhoof said. Donations will be accepted online through Dec. 1.